Mustangs Unlimited has been providing Mustang owners with parts and accessories since 1976! Three different catalogs are available: 1965-1973, 1974-2004, and 2005-Present. No handling or oversize fees. Classic Mustang parts and accessories 1965 - 1973 - Even cars that are expertly cared for require a slight repair every now and then. When you drive a classic car, finding replacement parts and accessories for even the slightest repairs can be a challenge. That's where Mustangs Unlimited drives in! 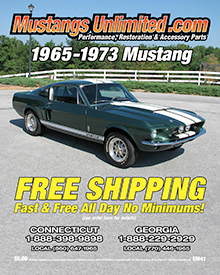 Browse the classic Mustang parts catalog for everything your classic Mustang model from 1965 -1973 requires, from genuine Mustang transmission parts to Mustang intake manifolds and engine performance parts. Speak with their classic Mustang parts and accessories specialists for help in selecting the right parts for your repair job, then order online or by telephone any time, day or night! Classic Mustang parts and accessories 1974 -2004 - Restore your classic Mustang vehicle with the highest quality Mustang reproduction parts and genuine vintage Mustang parts. The Mustang masters have assembled an inventory of the hardest-to-find classic Mustang parts and accessories your car requires for the perfect restoration, all available at classic prices! Whether you need classic Mustang parts for your engine, body, air or fuel system, you'll find parts from classic models from the years 1974 through 2004, ready for your restoration! Late Model Mustang parts and accessories 2005 - Present - Keep both your new and classic Mustang properly accessorized with Late Model and classic Mustang accessories including comfortable bucket seats in prime condition, steering wheels, stripes and decals, fender covers, plus Mustang themed apparel and gifts! From replacement Mustang seats to exterior trim and Mustang convertible tops that are as good as new, Mustangs Unlimited knows their classic cars as well as their Late Model Mustangs, and how to keep them looking and running their best. When your Late Model or classic Mustang needs some extra tender loving care, trust the experts at Mustangs Unlimited to bring your baby back to the high performance automobile it once was. At Mustangs Unlimited, bringing you Late Model and classic Mustang parts and accessories isn't just a business -- it's a passion!